Simple...no keys needed to Fill-R-UP! GC-69: Similar to above but in gloss black. GC-1: Tired of fumbling for and using your keys to access the fuel door at each gas stop? This Gas Cap Cover is clean and simple. 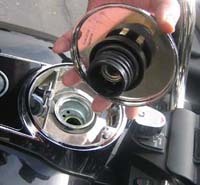 The chrome cover attaches to your stock gas cap. Just twist and open at you next refueling. 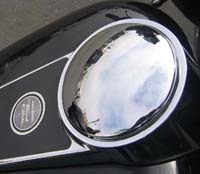 The Gas Cap Cover is beautiful show chrome and fits all Electra Glides and Road Glides up through model year '07. GC-42: Push Button Fuel Tank Console Door Release. An added convenience you'll appreciate at fuel stops. 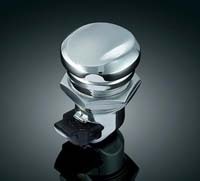 This lockable replacement for your stock fuel tank console door lock allows the door to be opened without a key by depressing the center button of the lock. For basic security, it can be locked with any barrel key. Fits model years '92 to current. GC-67: Smooth Push Button Fuel Console Door Release. Add stop-and-go speed at the gas pump. 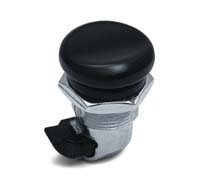 The smooth chrome-plated button replaces the lock for push-to-open convenience. No more digging in your pocket for the key. The large button is easy to operate while wearing gloves. Fumbling with your keys in the dark while trying to get your gas door open is not anyone's idea of fun. Add our Push Button Fuel Door Latch & make getting to the gas cap easy! It's a direct replacement for the stock key-lock fuel door latch. Fits: Harley:'92 to current Electra Glides, Road Glides (except '12-'13 & '18 FLTRXSE), Street Glides (except '11-'12 & '15-'18 FLHXSE), Tour Glides & '09-'18 Tri Glides (except '15-'18 FLRT). GC-28: Similar to above but in gloss black. 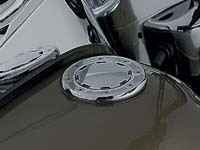 GC-09: These slick Flush Mount Gas Caps have the high-tech look of aviation-style fuel fillers. The built-in trim ring protects the painted surface around the filler opening from dings & gas stains. A keyed entry system permits their ultra thin profile & prevents tampering. No cutting required. 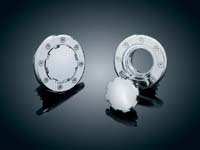 Vented gas cap version. GC-10: Same as above but non-vented version.